Clavicular breathing: From the shoulders and clavicle. Very shallow and least effective. Takes a lot of effort with the least amount of air. Abdominal breathing: Deep breaths from the diaphragm. Brings the air to the lowest and largest part of the lungs. Best breathing method! Breathing is the most basic of our bodily functions and something that we tend to take for granted. Breathing properly and understanding the importance of correct breathing is something that most people are unaware of. It is the 2nd foundation principle and is extremely important to our vitality. Oxygen is taken into your lungs with each breath you take and attaches itself to iron particles in your red blood cells. Your heart pumps the freshly oxygenated blood to your body via your arteries and delivers energy to each and every molecule. Oxygen is important for cellular metabolism and helps to maintain the acid/alkaline balance in the body. Breathing deeply from your diaphragm nourishes the spinal fluid and removes waste from the central nervous system. When you’re busy or overwhelmed and stressed, you tend to lose your optimal breathing patterns and the benefits of proper breathing become lost. For example, you take shorter breaths will breathe from the chest instead of breathing deeply from the diaphragm. If you only breathe from your chest, the muscles in your neck tend to shorten and become tight. This creates pain and discomfort in the upper cervical area of the spine. To breathe from the diaphragm takes some concentration at first, but it is so much better for oxygen delivery. Another cause of poor breathing patterns is poor posture. Standing with a forward head posture is very common and it places the body in a less-than-ideal position for diaphragmatic breathing. Your breathing patterns tend to be shallow and unproductive in this position. Stress has a negative effect on your breathing patterns, causing shortness of breath or shallow breathing. This creates a higher acidity level in your body, creating a catabolic state in other words, you are weakening your ability to recover and repair. Poor sleep and breathing contribute to an estimated 75% of all doctor visits. By taking simple steps to improve breathing patterns, you can achieve a more restful sleep and wake up in a more recovered state. So, how can you improve? To breathe properly, you must inhale through your nose, taking the air deep into your diaphragm. This should be a smooth breath in and not overly excessive. As the air fills your lungs, you should see your belly rise, almost as if you’re taking the air in to your tummy. Meanwhile, you should feel your sides and back expand gradually into your chest. The last place on your body to move during inhalation is your chest. The ideal pattern should be 2/3 diaphragmatic movement and 1/3 chest movement. If you’re unable to breathe in through your nose, it is a signal to check for food intolerances such as gluten and dairy. Ideally, your nasal passages should be clear and some food intolerances can cause congestion and blockage. You can practice improving your breathing techniques by employing Eastern Style methods of exercise such as Tai Chi, Yoga, and Chi Gongs. These methods not only improve breathing, but they can help you to reduce stress and clear the mind. Gary Jasmin is a certified C.H.E.K. coach, practitioner and trainer. As part of his holistic approach to health and wellness, he will show you the proper way to breathe and how it should feel from the diaphragm. 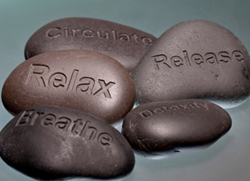 Click here for more information on lifestyle & stress management.